Revolver editor Sammi Chichester conducted an interview with DISTURBED frontman David Draiman at the two-day Ozzfest Meets Knotfest event, which took place September 24-25 at San Manuel Amphitheater And Festival Grounds in San Bernardino, California. You can now watch the chat below. 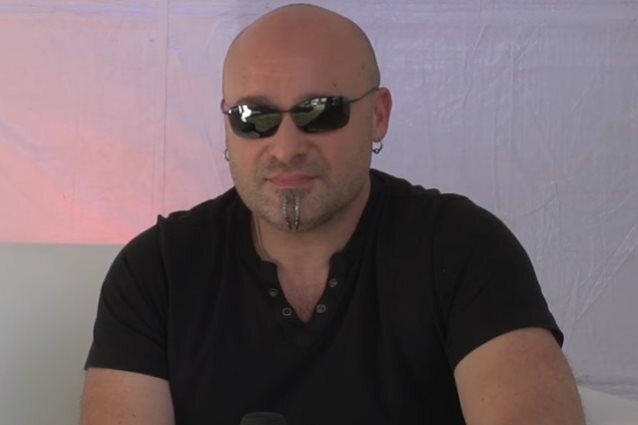 Asked to recall the first time he heard BLACK SABBATH's music, Draiman said: "The second record I ever bought was 'We Sold Our Soul For Rock 'N' Roll'. [But] that wasn't the first time I heard [SABBATH]. The first time I heard it was actually hearing those wonderful, dark and haunting three notes of the actual song 'Black Sabbath', and just being blown away by the beautiful darkness of it and how heavy it was and how it really grabbed hold of you instantly. And then once you hear the haunting vocal that one of the most, if not the most, seminal frontmen on the face of this planet, the most inspirational frontmen on the face of this planet delivered, Mr. Ozzy Osbourne, it just sent chills up my spine. I didn't know that music could go to that place, and it made me start a pretty amazing journey, really digging into everything that was SABBATH. I loved the groove of it, I loved the realness, the aggression that was paired with intelligence and really poignant lyrics; you've gotta give Geezer [Butler, bass] credit for a lot of that, obviously, who, ironically, over the course of the years of the blessed career that we've been able to have, I've actually developed a friendship with. He's a great guy. He actually was kind enough to do a guest spot on my DEVICE project that I had." He continued: "I know that Tony [Iommi] is a tremendous source of inspiration to Dan [Donegan, DISTURBED guitarist]. The whole band are absolutely amazing. And what more can be said about a band that everything has been said about?" DISTURBED is nominated in the "Best Rock Performance" category at this year's Grammy Awards. The band is nominated for its live performance of "The Sound Of Silence", while Beyoncé is up for her track "Don't Hurt Yourself", which features Jack White. The other nominees in the category include TWENTY ONE PILOTS for "Heathens", David Bowie for the title track from his "Blackstar" album and ALABAMA SHAKES for a live rendition of their song "Joe".